A must if you vacation in the south! Cool down when it’s over 30°C outside, relax and play, the 115m² of our pool await you. 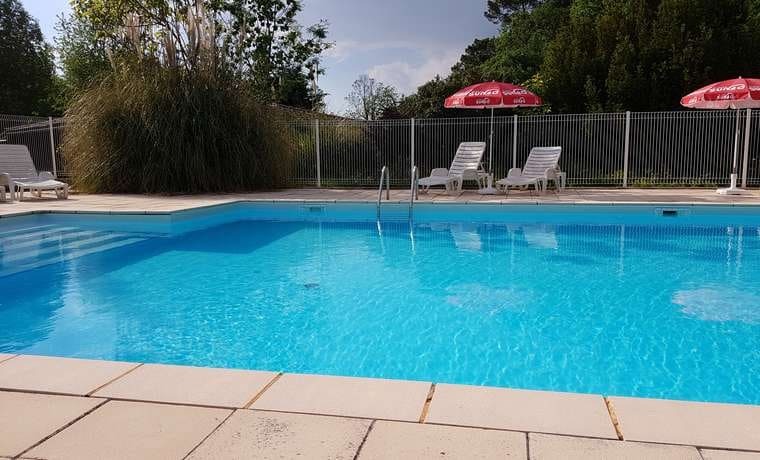 Looking for a campsite with a pool in Le Lot? You’re well on your way to your destination, the kids in the back are asking “Mom, are we there yet?” “when can we get to the pool?” Nothing beats a refreshing dip in the pool to relax as soon as you arrive. If you’d like, take your time and enjoy the pool, even before registering. Just drop by and tell us you’ve arrived, then come back later, relaxed and refreshed, to complete the paperwork. A campsite nestled in nature, with a heated pool ! The pool area is obviously secured, fully fenced-in with a locked gate so that small children cannot gain access without an adult. 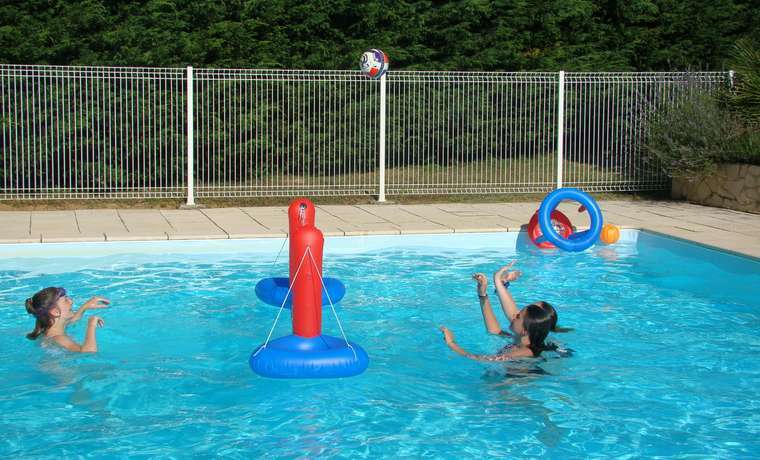 The deep end has a constant depth of 1m50 allowing for swimming or playing. With a 115m² surface, there will be plenty of room to enjoy. 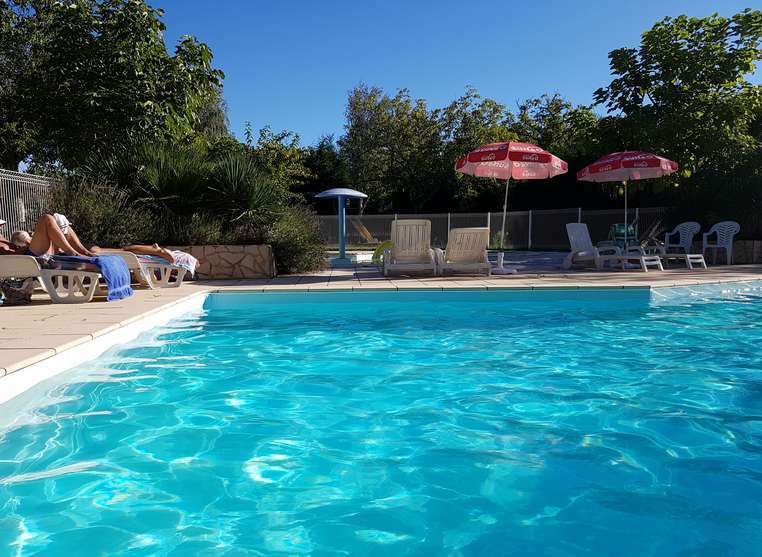 Important detail, especially for off-peak season: the pool is heated! You can even check the temperature on the thermometer installed in the pool. Don’t be surprised to read 27°C or above when the sun beats down on it! Unlimited swimming and relaxing, just for you. The pool is opened everyday starting at 9h45. Because we love the prolonged summer evenings, the pool stays open until 21h in the summer. Need a little break after playing with the kids? Enjoy the lounge chairs around the pool. 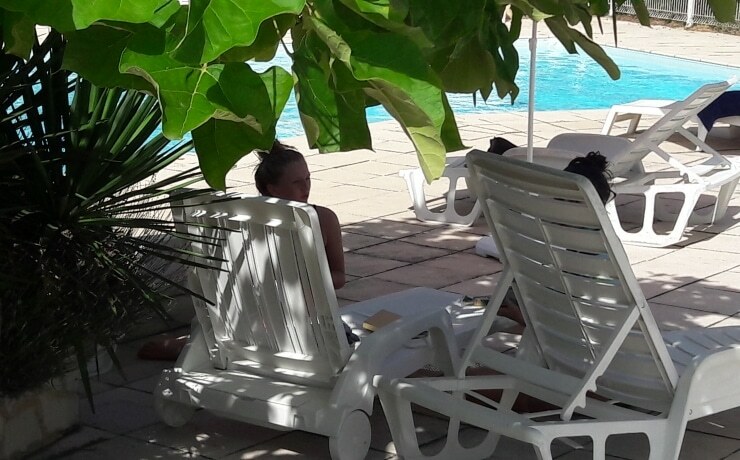 You can stay shaded under the umbrellas, or under the trees close by. What to wear at the pool ? We have the usual rule: boxer swimsuits, bermuda shorts or boardshorts are not permitted in the pool area. Pretty common rule, but do you know why? It’s because these types of shorts could potentially be worn all day. By keeping them out of the pool, the goal is to protect water quality and limit contamination from dirty clothing. Also, ample shorts usually have pockets. Things like papers, small objects could be left in the pockets and end up floating in the pool, and we don’t want that! Less contamination in the pool means less chemical usage, and that’s good for the skin, and the environment ! That’s also possible in 115m²!